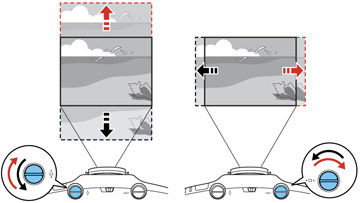 If the projector cannot be installed directly in front of the screen, you can adjust the position of the projected image using the lens shift feature. Note: Wait 30 minutes after turning on the projector before setting the focus, zoom, and lens shift for maximum accuracy. Turn on the projector and display an image. 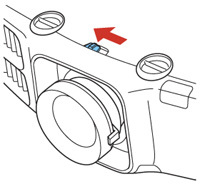 Slide the lens shift dial lock as shown to release the lock. Turn the vertical and horizontal lens shift dials on the projector to adjust the position of the projected image as necessary. Note: The image cannot be moved to both the horizontal and vertical maximum values. When you are finished, slide the lens shift dial lock as shown to lock the dials. 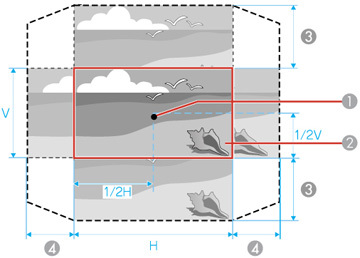 When adjusting the image height, position the image lower than where you want it to be and then move it up using the vertical lens shift dial. This will help prevent the image from moving down after adjustment. Keeping the vertical and horizontal lens shift dials in their center positions produces the clearest picture.